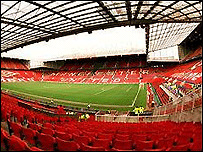 Pupils with the best attendance records at a Cardiff secondary school will win the chance to visit Manchester United's Old Trafford ground. 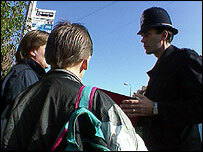 Community police officers came up with the plan in an attempt to tackle truancy at Llanedeyrn High School. The school's assistant head, Roberta Prewett, told the Western Mail the scheme "captured the imagination". But the idea has been criticised by the National Association of Head Teachers in Wales (NAHT). Pupils with a minimum 95% attendance record will go into a draw for the trip later this month. Nine pupils from each of the five years will be picked. But Iwan Guy, acting director of the NAHT, told the BBC's Good Morning Wales programme it was not a route he would advise schools and head teachers to travel. "What about the ones who struggled, who got into school, but didn't win? That's a disincentive for them to go the next time," he said. "It's truancy they're trying to tackle and we would certainly prefer to look at the root causes of truancy. Many of these pupils away from school are away with parental consent." The chairman of the pressure group the Campaign for Real Education, Nick Seaton, said it turned the "law and basic morality" on its head. He said: "The law says they should go to school until they're 16 years old, unless the parents have officially opted out and decided to educate them at home. "And a normal convention is you don't get rewarded for obeying the law, you get punished if you don't - and I think that's how it should be over truancy." Mr Seaton said truanting pupils should instead be punished by detentions, making them attend Saturday school or using the "full force of the law" against children and parents. He added that rewarding children for attending school suggested education was so "worthless" you had to pay to accept it. "The reward is preparation for life... when they start work no employer is going to give them extra rewards for turning up on time or turning up every day." But the school has defended the scheme. Assistant head Ms Prewett told the Western Mail: "Good attendance is a huge priority and we already have a number of initiatives. "But this one has really captured the imagination and we are grateful to community police officers for arranging it." Police community safety officer Laura Moore also told the newspaper the idea was a "nice incentive" which had improved the police's relationship with children at the school.